Leave the stress of the everyday world far behind and escape to an idyllic sanctuary in this exclusive Isle of Capri enclave. 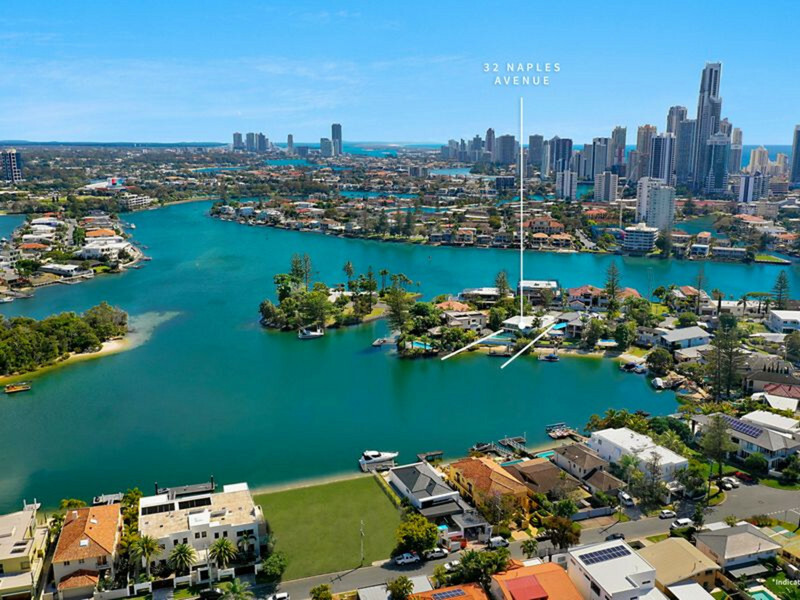 Nestled in the tightly held Adam’s Basin, this magnificent architectural masterpiece, designed by Bayden Goddard, sits proudly on a sprawling 913m2 fan-shaped block and sets a new benchmark in luxury, yet family-friendly waterfront living on the Gold Coast. Boasting multiple areas to entertain or unwind in style, the vibrant heart of this home awaits in vast open plan living, kitchen and dining areas. Set under a soaring 5.4 metre ceiling, with bespoke lighting and oversized picture windows, this is a room infused with sunlight and soul. Integrating effortlessly with the alfresco area, you’ll enjoy an outdoor kitchen, 12 metre pool with separate spa and a 26.8 metre stretch of sandy beachfront plus a pontoon able to accommodate a large vessel and offer easy ocean access. The master suite is the other jewel in this modern oasis. Grand in size and appearance, it’s set against the backdrop of wide water vistas with a generous walk-in-robe plus a sophisticated, open plan ensuite. • Positioned at the end of a prestigious cul-de-sac, close to shops, cafes, restaurants and more. The best of both worlds also beckons with this location – enjoy the peace and privacy which comes with its quiet Adam’s Basin setting, but with the luxury of Main River living. You’re also only 550m from the shopping and dining precinct, Capri on Via Roma and 2km to the vibrant offerings of Surfers Paradise. Elite schools, TSS and St. Hilda’s are also within a 6.5km radius. All there is left to do is simply move in and enjoy the spoils of living in a residence impeccably designed by award-winning architect Bayden Goddard.